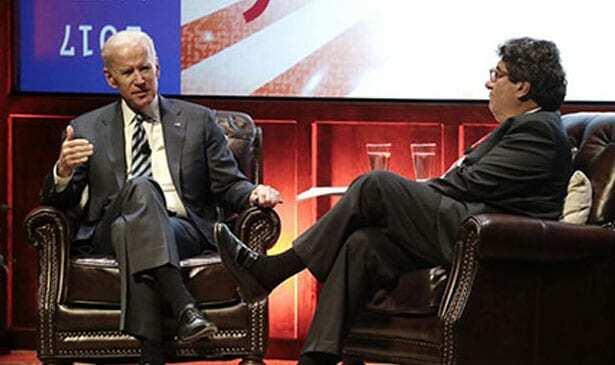 NASHVILLE, TN — An energized and articulate Joe Biden expressed concern about the worsening political climate in Washington last week in a public talk here with Chancellor Nicholas Zeppos on the Vanderbilt campus. He cited as an example the reaction of President Trump to the Charlottesville, Virginia rally by white supremacists. It prompted Biden to write a political column expressing his worry about the deterioration of political relations. “I wrote [the article] because I wanted to remind us of who the hell we are. What we are made of. We are not people that have been divided. We are not people based on tribe or religion. We are a people based on ideals. We’ve not met the ideals, but we’ve never denied that we have to strive for them. But there’s something missing now,” said Biden. Biden said he could trace the loss of political comity in the Senate and Congress to the Newt Gingrich Tea Party “revolution” in the early 1990s. Before that time, he would sit and listen to debates with his Republican friend and colleague, John McCain. They would eat lunch together, argue politics and hang out with each other. “We’d have these terrible debates and we’d end up going down and having lunch together. The political system was not broken. The political system functioned. People played by the basic rules,” Biden said. Then, in the Gingrich era, each political caucus told both Biden and McCain to stop eating lunch and sitting together. Biden pointed out the Senate lunch rooms were now gone and there was no place for Republicans and Democrats to meet on a social level with each other on the Capitol grounds. Biden cited conservative columnist David Brooks as someone also worried about the damage to our national morality. Joe Biden talked about the impact of the loss of his wife and daughter in a car accident in 1972 and then the loss of his son Beau Biden in 2015 to cancer and its effect on his decision to run for office. He said he was still dealing with the loss of Beau to brain cancer. He said he would consider again in January whether to try a run for the Presidency. He harkened back to the values he saw that America still has and part of the evidence of that was the election of Barack Obama. The conclusion of Joe Biden’s talk was greeted with standing ovation and cheers from the audience.